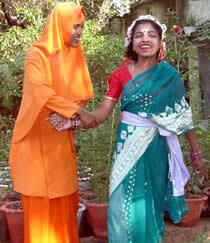 Shrii P. R. Sarkar the founder of Gurukula has composed over 5000 songs collectively called Pragahta Samgiita. These songs have become a new school of Music in India. In Kolkata a yearly event of competition in vocal, dance and art on Prabhata Samgiita are held at the Ananda Marga Tiljala campus. Music competitions are very popular and in the course of the past years the School of Prabhata Samgiita has acquired a high status. This year even Calcutta University has included Prabhat Samgiita into their competition for their college students, besides other Music Schools such as Rabindranath Tagor Samgiita. In over 50 Ananda Marga Schools and Centres preliminary contests were held and the finalists got the chance to travel to Kolkata. This year they gathered on the exact anniversary of the first song, Prabhata Samgiita Day, which is September 14 for the finalists’ competitions. Besides the vocal, dance and art in four age groups there were also contests in choir and group dances as well. This year there were 661 candidates as competitors. 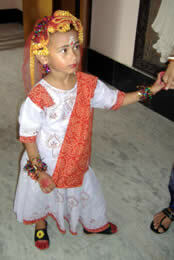 Dance competition was held in Dhyan Mandir and six other rooms in the main building. The art competition was also held at the main campus. Song competition was held at the nearby WWD School and Dhyan Mandir. It was a hectic day with some 200 staff of volunteers working and accommodating all the 1850 participating children including their guardians at the premises. The Tiljala campus was humming with intense activity. The finalists and all participants had a wonderful time of music, dance and art. In the jewel-case of my mind. In whom everything is lost. Today I have attained the Lord of Light. © Ananda Marga Gurukula. Al Rights Reserved.